Her finner du notater til en prøve omhandlende britisk historie i samfunnfaglig engelsk. Notatene tar for seg utviklingen av styresett, makt og politikk i Storbritannia fra Elizabeths død i 1603 fram til i dag. Elizabeth I – dead in 1603. The balance she had kept between rival powers in the kingdom began to break down. James I – Elizabeths scottish cousin. Charles I (James successor) failed to keep the peace. He had a catholic wife. 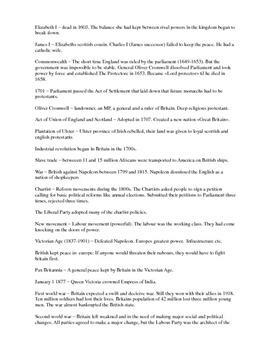 Commonwealth – The short time England was ruled by the parliament (1649-1653). But the government was impossible to be stable. General Oliver Cromwell dissolved Parliament and took power by force and established The Protectore in 1653. Became «Lord protector» til he died in 1658. 1701 – Parliament passed the Act of Settlement that laid down that future monarchs had to be protestants. Oliver Cromwell – landowner, an MP, a general and a ruler of Britain. Deep religious protestant. Act of Union of England and Scotland – Adopted in 1707. Created a new nation «Great Britain». ble litt skuffet, men grei info! kort og enkelt skrevet fakta. Føler stilen er skrevet for den personen selv som skrev den. Litt rotete for andre.